"Enriching the lives of youths by introducing them them to art, music, and cultural programs that build character, self-esteem, and spirt." As the principal of Crown Point Junior Music Academy, I have had the pleasure to work with Three Treasures and their staff throughout each school year. When I have asked parents about the program, all parents have given me positive reviews about the staff and the program overall. I appreciate how Three Treasures embeds music into their focus of culture, self-development, and mindfulness supporting the “Whole Child.” I look forward to a new school year knowing that our students who participate with Three Treasures are in a safe enviornment with staff who not only care children, but ensure learning goes beyond academics. Three Treasures has been an invaluable program at Hage Elementary. They have been great partners in supporting families with fantastic enrichment opportunities and homework assistance. Three Treasures is extremely popular with our families as they provide programs that students enjoy, from Hula to Lion Dancing and more. Students consistently rave about their experiences. Parents have shared with me that they love the program because they have homework help and provide a balanced experience for their children after school hours. As a Principal, I enjoy the high level of service Three Treasures has provided our community. The program is well organized, communicates effectively, and directly gives back to our community. I look forward to maintaining and growing this partnership for years to come. Hi returning families! Thanks for your patience. To the left is the registration fee option for the upcoming school year. PLEASE BEFORE YOU PAY IT, I would like for you to consider paying the YMP year in full and get a couple months of the YMP free. You may reach Sifu at info@ttcaskf.org to get more information. This upcoming year will be an exciting one. We are continuing to add value and improve our programs. We will be adding additional science and math to our popular cultural classes. For older students, we are looking into adding Math Olympiad and bring back our music program. As you know, we have opened a new center for Three Treasures friends and family, and that will not only house a new middle school program and all our programs but also a new cheerleading, gymnastics/tumbling, and sports programs (badminton, basketball, ping pong, weight room, dodge ball, and more. We have also added a new performing arts department centered around dance, music, and drama. Hello potential new families to our YMP! It is always an honor when potential new families are interested in our YMP. Please contact us at info@ttcaskf.org before you pay the registration fee. It is imperative that we help make sure that our program is right for your child. While we have grown and well respected, our program is not for everyone. Like you, we want what is best for your child and the first step is to contact us so one of our Assistant Program Coordinators may begin dialogue about your child's needs and tendencies. If you accidentally pay the registration fee before one of our APCs approves you, we will simply put you on hold until the registration and suitability procress is complete. Once again, thank you for thinking of us. We want to welcome families from our newest schools Ericson and Sandburg Elementary! Thank you for visiting our Youth Mentorship Program page! Enrichment programs for youths is a key component of fulfilling our Vision of helping build future community leaders. We work closely with teachers, Principals, and parents so we may become good allies for the parents of our students. The YMP is composed of academic, cultural, and physical education that, together, give our students opportunities to practice mindfulness. Each day of our program has different enrichment classes. We can customize things to fit around other activities that your child may be in. Is Our Program Right For Your Child? We will not accept your child without first meeting with you in person. We will go over our curriculum and teaching style to see if it works for your child. Please note we are not a licensed child care provider. While our staff are FBI fingerprinted and CPR certified, there are limitations to our program. If you need a licensed child care provider, we suggest Character Builders, Klassic Kids, or other long standing programs that may be available in your school. While our staff are patient and compassionate, they are not trained to handle children with chronic behavioral problems or those with health issues beyond our scope of training. The YMP is a structured environment where homework is expected to be completed and real lessons are taught. What Are a la Carte Classes? These are classes that go into greater detail than in the Youth Mentorship Program. The classes in the YMP are designed to change periodically so we may expose the students to more activities. A la carte classes are great for students who do not need to dabble and know exactly what they want to learn. These are taught right after school in a different room from the YMP and generally run 60 to 90 minutes depending on the subject. They are a separate cost and your child does not need to be in our YMP to take an a la carte class. Our hours and fees vary between the different sites we are in. Our Youth Mentorship Program runs $360 a month and includes coverage for minimum days and months with more than 20 days of instruction (4 weeks). The YMP fee will go up to $399 as of Sept 1st, 2018. Our a la carte fees range from $75 for more basic classes to $100 for more advance level ones. Typically, classes are divided into 6 week blocks. We all pay a high price to live in beautiful San Diego. Oftentimes, both parents have to work to make ends meet. This leaves a cavernous hole to fill in raising your child. That's where we come in. We are unparalleled in how much support offered to parents. From Parents Night Out to telling your child to eat their vegetables, we become your ally. We help ease that guilt you feel for not being able to spend as much time with your child as you would like. While they are with us, not only will they be loved but their homework will be done and we are helping teach family values. Our YMP is structured to save you money in the long haul. If you individually priced out each of our programs, the total fees would near almost $1000 a month plus the cost of driving your child around town to get to those lessons. It is uncommon to find high quality lessons packaged into one program. 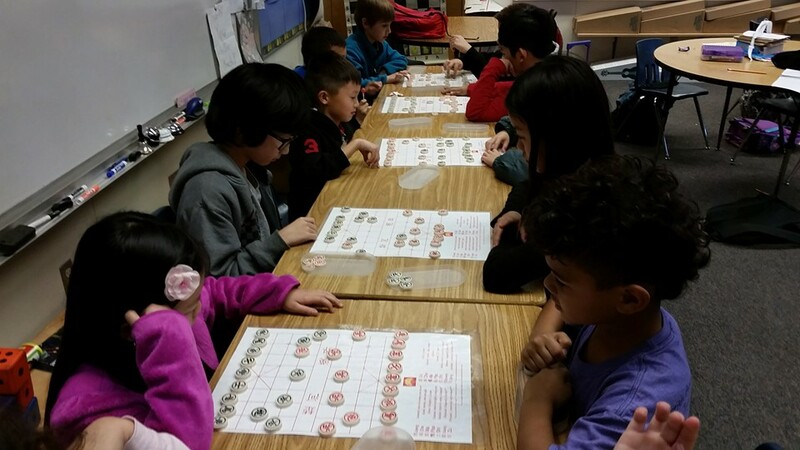 (Below Left): Students at Hage Elementary engaging in Chinese Chess. 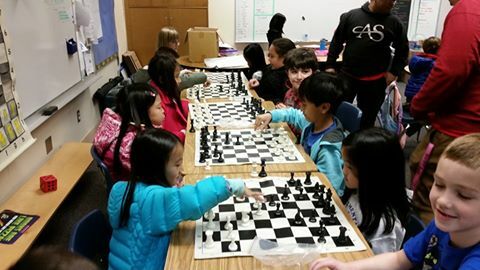 As far as we know, we may be the only program in San Diego teaching this rare form of Chess.